This recipe has every flavor we love with Thanksgiving all rolled up into one dish! Plus it’s loaded with vitamins and minerals that make it a nutritional powerhouse to enjoy any night of the week. It has an excellent balance of protein, complex carbohydrates, and healthy fat to help keep your blood sugar stable while also satisfying your cravings for all of falls comforting flavors. Preheat oven to 350ºF. Combine maple syrup and 1 tsp olive oil in a small bowl. Cut the squash in half, scoop out the seeds, and brush with maple syrup and oil. Place cut side down on a baking sheet and bake for 15-20 minutes. In a large skillet, add 1 tsp oil + 2 tbsp of stock over medium-high heat. Add celery, onion, mushrooms, garlic, and apple and cook for 3-4 minutes or until onions are translucent. Add remaining 2 tbsp of stock + ground turkey to the pan and cook until meat is no longer pink (about 5-7 minutes). Add parsley, thyme, sage, salt and pepper and cook on medium heat for an additional 3-4 minutes or until liquid is absorbed. 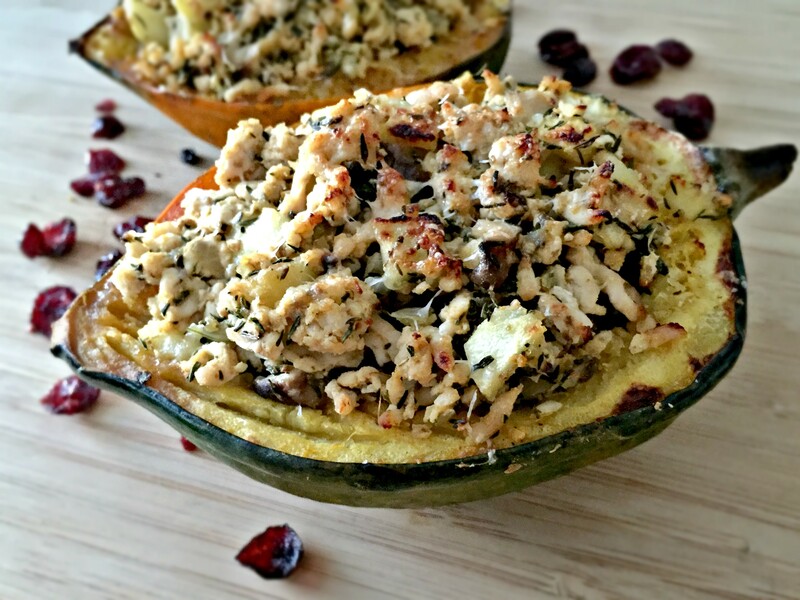 Remove squash from oven, flip cut side up, and fill each half with stuffing. Place back in the oven for 5-10 minutes or until slightly browned on the top.